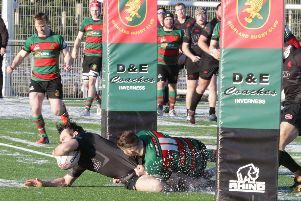 Biggar head coach Gary Mercer has declared himself happy with his side’s fifth place finish in the BT National League Division 2 this season. Though he admits that his pre-season aim was to gain promotion, he paid tribute to the effort and commitment of his squad over the course of the 2017/18 year. “In general we were looking for promotion but when you look back with hindsight, you look at the season and as it goes on, you start to pick up injuries,” he said. “So you look at your squad and ours is quite small. It’s probably one of the smallest squads in the league. We had a few injuries early on, we lost a prop, there were a few things that went against us. “But the effort and commitment through the season from all the boys was absolutely fantastic and that was proven by finishing fifth in the league. “Yes, we were out of contention for promotion but it was still a very satisfying season. Attacking-wise Biggar are the most dangerous team in the league racking up 613 points, which Mercer says he is “over the moon” about. “Our attacking game improved immensely especially early on and our defence came strong at the back end of the season. With his side so strong in attack Mercer admits that there is an element of frustration that some defeats could have been wins had they been stronger defensively throughout the season. He said: “If you look we have six losing bonus points – that’s within five points of losing those games. “Five of those games were within three points and when we spoke about those games as a group it was bit disappointing because we could have won them. “It was maybe just a lack of concentration or experience at times in the game which has cost us those victories and ultimately promotion. “When we played all the teams the first time round we thought that we were better than all them. “So on reflection that’s the frustrating thing. The boys knew that we outplayed these teams and it was our own fault that we lost those games. Mercer says the emergence of young talent throughout the season has been pleasing. “The big positive for me is the young boys coming through now. “Rowan Stewart and the twins, Matthew and Lewis Stewart all came through the colts. The twins played in the last game and were outstanding. “Lohan Kutze also came from the colts and played the last nine games and was outstanding also. “In terms of development and going forward the future is very bright for Biggar. “What they need to think about is what is the best development for them. Is it going away and being in the second team at a city side, or is it staying at home playing with your club of origin where you made your name and play first team? In terms of matches there is one that stands out as a highlight for the head coach.